Reports from Tehran indicate that security forces used teargas today to disperse anti-government protestors gathered in Haft-e Tir Square. The reports also indicate a large group of people have gathered at the burial site of Ali Mousavi, the opposition leader's nephew killed by security forces on Ashura, in Behesht Zahra cemetery. In a related development, the government today denied reports appearing in opposition websites that a large mechanized military force is moving toward Tehran. Rumors had spread in the city that a de-facto martial law was being staged. Government-organized rallies were staged today across Iran. Tens of thousands of government supporters took part in demonstrations, chanting slogans against the leadership of the Green movement. Their message: Repent or we will confront you as Mohareb (enemy of God). In Tehran, crowds burned American and British flags. 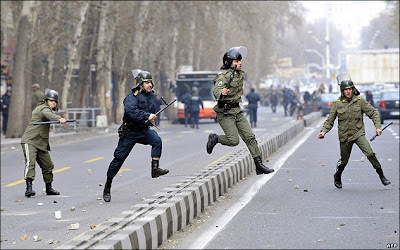 The Islamic Republic of Iran Police Force (IRIPF, also referred to as NAJA) appeared hard pressed and even overwhelmed at times, during anti-government demonstrations held during Ashura. 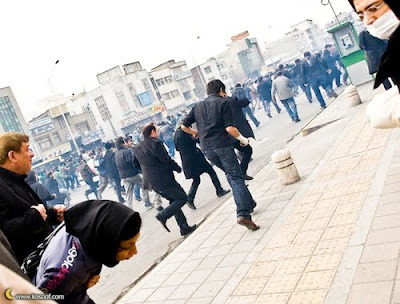 There were incidents reporting varying levels of protest around the country, including Tehran, Shiraz, Esfahan and Mashad. 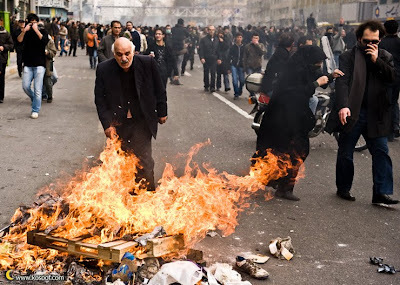 However, by far the greatest confrontations took place in Tehran, and that's where nearly all the photo and video evidence has been sourced (with most of the documented action located at Vali Asr Square, Azadi Avenue and under Hafez Bridge). 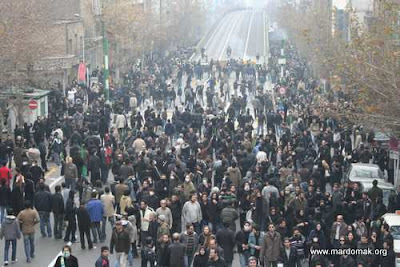 At times, protesters in Tehran showed exceptionally high levels of resistance to IRIPF attempts at imposing law and order. There are a number of photos and videos showing large groups of protesters seizing the initiative, and in a number of instances taking full control of key road and city centers. 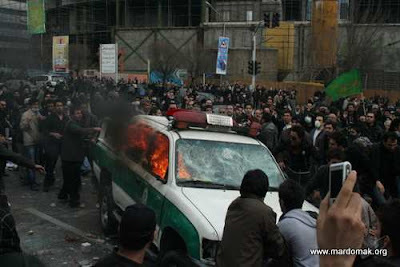 There are also photos and videos showing police officers beaten by angry mobs, police equipment captured, vehicles wrecked and set ablaze, and even at least one IRIPF police station and one Basij base stormed, looted and set ablaze. Protesters engaged in opportunistic destruction of public property, while elements of the IRIPF- including its motorized SF- were at times overwhelmed and rendered ineffective. 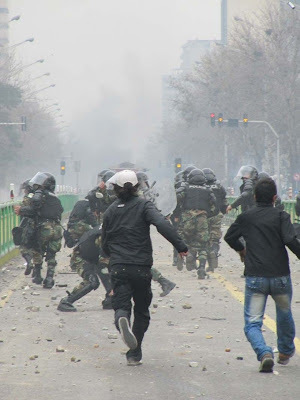 For all the protest violence and lack of effective IRIPF control over key areas of the city, it is surprising that Iran's military wasn't activated. 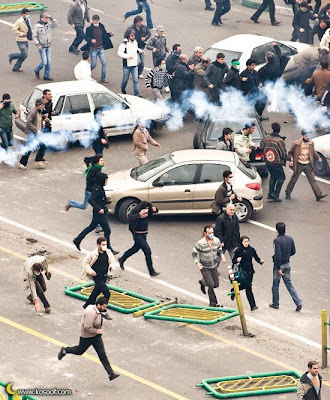 Instead, the IRIPF (and Basij) were left to duke it out with an ever more radicalized protest movement. 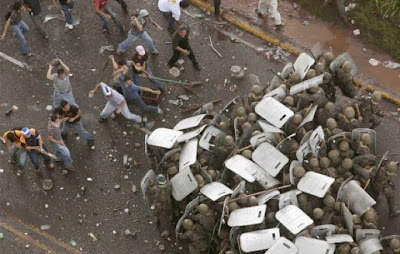 In fact, while the anti-establishment movement of June 2009 may have had far greater numbers, nevertheless this comparatively smaller anti-government protest (seemingly composed predominantly of students or those of similar age) is certainly willing to take increasingly more violent and destructive measures. It does so while the IRIPF has apparently (unlike in June) been ordered to confront the protesters with less-lethal means of crowd control (no standard outfitting of firearms equipped with lethal rounds). IRIPF anti-riot management appears to rely on preplanned defensive positions, adapting to changing conditions with radio communication and applications of motorized (motorbike) reconnaissance. Despite possession of airborne police support, it doesn’t appear the IRIPF engages in sustained air-to-ground assisted tactical management. Politically, so far the IRIPF seems to be the public face for the government’s anti-riot response during Ashura. Iran's Deputy Police Chief Ahmad Reza Radan appeared on IRINN television, to inform the Iranian public that 300 protesters had been arrested and there were several killed. Meanwhile, contrary to one of the many wild rumors propagated over Twitter of high ranking members of the government being evacuated to safety, Supreme Leader Khamenei and President Ahmadinejad attended the Ashura ceremony at Tehran's Hosseiniyeh Imam Khomeini, seemingly unaffected at all by the disturbances occuring at other parts of the city. 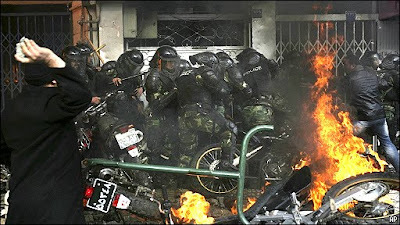 The Iranian leadership’s strategy appears to consciously downplay the unrest. This would explain the government’s refrain from activating the military or even declaring full or even partial martial law. Instead, it appears the IRIPF is burdened with less-lethal force (in instances where even US law enforcement would use lethal means of defending itself), in confrontations that stretch its summoned resources beyond the maximum. The other side of the government's anti-protest strategy appears to be the targeted arrest of anyone perceived capable of providing any aspect of leadership to this so far leaderless movement, or anyone suspected of being able to provide linkage to identified internal and external threats. Incredible video of protesters engaging police forces with rocks; then on a signal from a spontaneous leader, the mob surges forward to engage the police at close quarters. IRIPF/SF motorized detachment, contained and trapped against a doorway by vastly superior numbers. Note how quickly fires are generated, suggesting the use of molotov cocktails, but more likely ignited by the simple use of cigarette lighters. Another view of the same incident: fully equipped anti-riot policemen cornered, surrounded and (lacking firearms or adequate backup) subjected to stoning and multiple beatings. IRIPF/SF First Lieutenant (Sotvan Yekom) from the same detachment, beaten and stripped of gear. Demonstrators unsuccessfully attempt to set his field jack on fire. A bloodied IRIPF anti-riot policeman is escorted away by protesters, while a IRIPF (cadre) First Lieutenant (Sotvan Yekom), with 2-way radio in hand, feebly waves him aside. Protesters engage a heavily outnumbered IRIPF detachment at a cross street, to be dispersed by what could be shots fired (possibly less-lethal rounds, unfortunately there is constant sound buffeting on the mobile device which produces similar sounding effects). The protesters reassemble, but are then successfully outflanked by motorized IRIPF anti-riot forces approaching from up the street. Overturned IRIPF vehicle, set afire by demonstrators. Location: Khosh Avenue. IRIPF police van overturned and set ablaze. There are a number of YouTube videos showing IRIPF vehicles torched and destroyed during Ashura demonstrations in Tehran. At the end of this video, two IRIPF policemen become separated from their unit and surrounded by violent protesters, to be brutally beaten and bloodied. IRIPF police station stormed, looted and set ablaze at Vali Asr Square. At the end of the video, a severely wounded and bloodied protester is taken away; purportedly a victim of being run over by a police vehicle. IRIPF police van surrounded and heavily vandalized. Its officers- lacking firearms and adequate backup- are seized and beaten by the angry mob. Street melee: IRIPF anti-riot police officers are put on the defensive and swarmed, firing tear gas in retreat. Yet another IRIPF police vehicle set afire. Possibly an IRIPF Bell 214 helicopter zooms overhead. It appears to be operating in a transport role, rather than any sustained effort at air-to-ground, emergency management. IRIPF police van (a type used for transporting arrested suspects) is overturned and set ablaze. Tehran Fire Department vehicles on emergency call, situated (perhaps immobilized) at the scene of an overturned IRIPF police van. And yet another view of an IRIPF police van attacked and overturned. By dusk, apparently the IRIPF had still not gained full control over the city. Note several fires burning at this Tehran intersection. 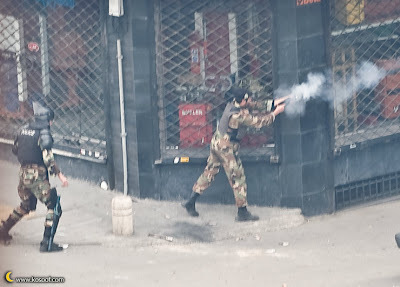 Well equipped IRIPF/SF firing a tear gas anti-riot gun, in an attempt to disperse protesters. Well disciplined platoon of IRIPF conscript-soldiers in a defensive phalanx formation. Note the level of aggression shown by the stone throwing protesters, and the amount of expended debris on the ground. Another shot of IRIPF conscript-soldiers in a defensive phalanx formation, with IRIPF (cadre) officers looking on. 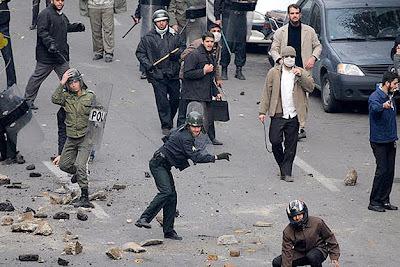 Protesters were seen tearing out slabs of concrete from Tehran's city sidewalks and smashing it to hurl stones at security forces. Photo of incident depicted in videos 2, 3 and 4. 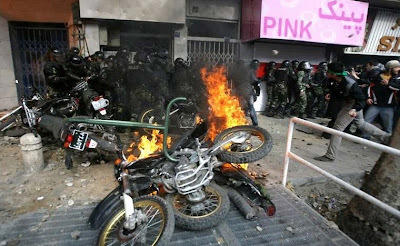 Motorized IRIPF/SF policemen are trapped, forcefully dismounted and surrounded; to be stoned, beaten and their motorbikes set ablaze. They are not equipped with firearms for personal defense. Another photo of the cornered IRIPF/SF policemen. At right, an un-helmeted and bloodied First Lieutenant (Sotvan Yekom) pleads on behalf of his beleaguered motorized SF detachment. This is the same officer shown in a previous video, subsequently beaten and partially stripped by the enraged mob. IRIPF conscript-soldiers (most likely 18-20 year olds serving out their mandatory conscription terms) overwhelmed at close quarters by violent protesters; in retreat minus various pieces of their anti-riot equipment. 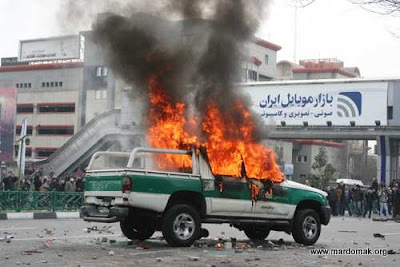 An abandoned IRIPF utility vehicle stoned and set ablaze by protesters. And another demolished IRIPF utility vehicle seen burning amidst a crowd of destructive protesters. 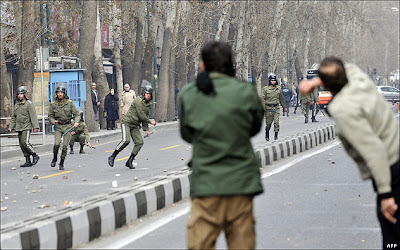 IRIPF conscript-soldiers engaged in a contest of stone throwing with protesters on a Tehran street. 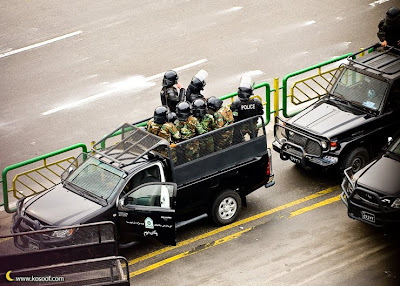 Good view of an assembled IRIPF street position, including mixed elements of conscript-soldiers and police regulars, as well as the use of an IRIPF utility vehicle. Protesters' expended stones can be seen everywhere. 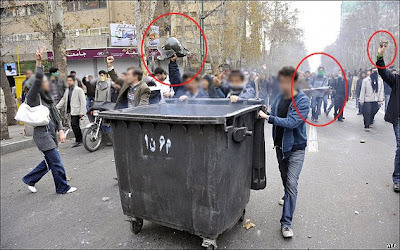 Note the protesters' captured anti-riot police helmet, the combusted contents of a metropolitan garbage bin, the use of a makeshift club and the ubiquitous throwing stone. An IRIPF regular First Lieutenant (Sotvan Yekom) leads a group of conscript-soldiers; engaging protesters in a contest of stone throwing. A protester attempts to pick up and repel an expending tear gas smoke cartridge. An IRIPF/SF detachment retreating, in the face of overwhelming numbers of protesters engaged in stone throwing. Note the visible expenditure of stones ssen scattered about the street. The Christian Science Monitor today carries a dispatch by its correspondent Isaon Athanansiadis on the road ahead for supporters of the Green movement after Ashura. Athanansiadis quotes this blogger on the organization and the participants of the recent demonstrations in the country. 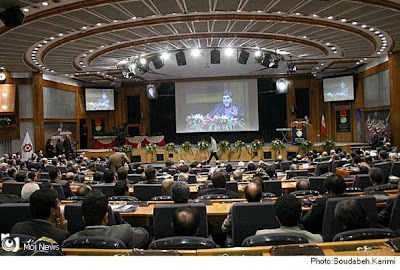 “The student organizations at major universities are still the most organised fora, but the youths have found other organizations that appear to be non-political, such as associations of painters and calligraphers, where the news of planned actions and slogans are passed along,” said Nader Uskowi, a Washington-based Iran analyst who works for the US government among other clients. “The students and the youths are still the engine of the movement but it is rapidly spreading to other segments including parents who are actively supporting their children." 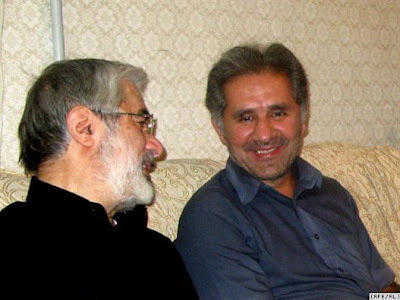 Police has arrested Ali Reza Beheshti, a top aid to opposition leader Mir Hossein Mousavi. They have also arrested some of the well-known personalities of previous reform movements, including Ebrahim Yazdi, a former foreign minister and a non-cleric architect of the Islamic Republic. 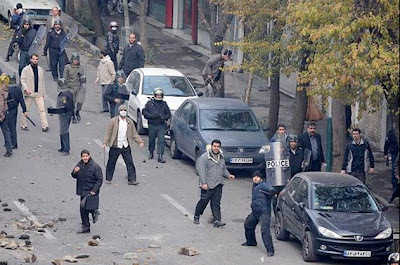 Sporadic clashes between the security forces and the Greens continued today in Tehran. 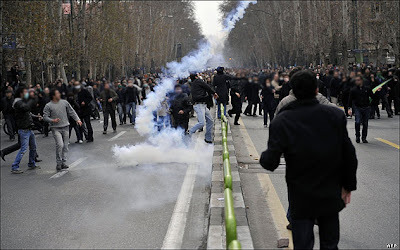 Police fired teargas on crowds gathered in front of Ibn-e Sina hospital in Tehran where the body of Ali Mousavi, the opposition leader’s nephew, is kept. The younger Mousavi was one of at least 10 people killed by security forces on Sunday. 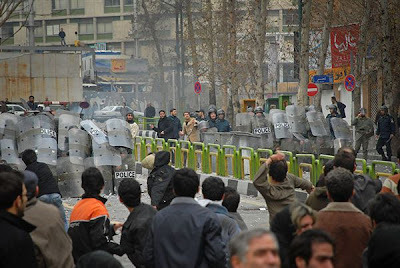 Iran’s state-owned TV website confirmed that four people have been killed and around 300 people arrested during today’s anti-government demonstrations in Tehran [IRIB, 27 December]. Tehran’s police chief had earlier denied any killings, telling reporters that his officers were not even carrying weapons. Photos taken today on the streets of Tehran told a different story. Among the dead was the nephew of the opposition leader Mir Hossein Mousavi. UPDATE: IRNA has revised upward the number of people killed today in Tehran to five. UPDATE: The death toll during the nationwide protests has risen to 10: five in Tehran, four in Tabriz and one in Shiraz, making it one of the bloodiest days since the post-election uprising began in Iran. Parleman News, a news site of Iranian Majlis, and Kalemeh, the site close to opposition leader Mir Hossein Mousavi, are reporting that Mousavi’s nephew, Ali Habbibi Mousavi Khamene, was killed in Tehran during today’s demonstrations. Reports indicate that Mousavi is now at Ibn-e Sina hospital where the body of Ali Mousavi was taken. People Chanting: "Kill, Kill, Whoever Killed My Brother!" 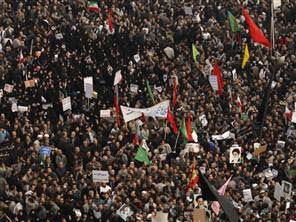 Thousands of anti-government demonstrators gathered in Central Tehran today, chanting slogans against the leadership of the Islamic Republic. 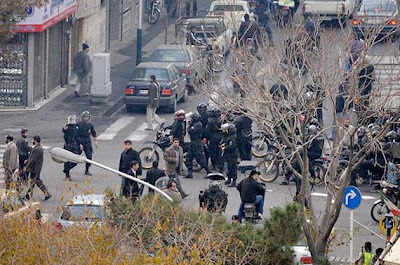 There are reports of four fatalities and shooting by the security forces on the streets of Tehran. Iran’s official news agency IRNA reported that the “remnants of Mousavi cult” [the opposition] have created havoc in Tehran [IRNA, 27 December]. 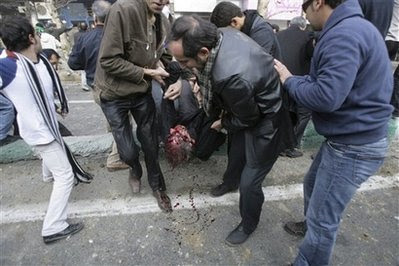 Commander of the Greater Tehran Police has denied reports that four demonstrators have been killed. Brig. Gen. Rajabzadeh told reporters that police forces were not carrying weapons today. The police chief’s denial came after photos of dead people on the streets of Tehran were widely circulated throughout Internet. The photos also show uniformed security officers shooting their pistols. Is Iran on the verge of a popular explosion? 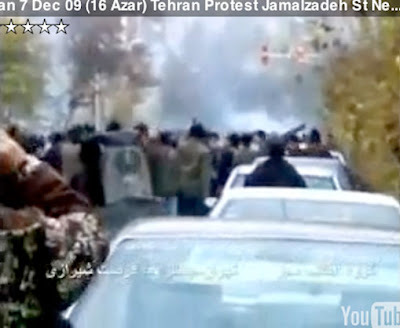 GlobalPost carries a dispatch by Iason Athanasiadis on widening of the scope of protests across Iran in recent days. Athanasiadis examines the importance of the spread of the movement to smaller cities and quotes this blogger on government’s failure to contain the Greens. “The government chose to wage a campaign of attrition as opposed to an all-out attack on the Greens,” said Uskowi. “It hoped the youths would lose their focus but in reality it was the government forces that lost their vigor." 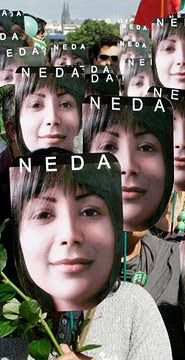 The Times of London has chosen Neda Soltan as Times Person of the Year. The manner of her death, and the regime’s response, has shredded what little legitimacy it had left. She helped to inspire an opposition movement that is now led by her generation, which a systematic campaign of arrests, show trials, beatings, torture and security force violence has failed to crush, and whose courage and defiance has won the admiration of the world. Two days after Iran’s foreign ministry spokesman rejected a nuclear swap deadline set by the US, Iran’s Foreign Minister Manouchehr Mottaki said on state-run TV that Iran “does not have a problem” with nuclear swap if the exchange takes place in neighboring Turkey [IRIB, 25 December]. Mottaki thus reversed his earlier declaration that Iran would only accept the exchange on its own territory. In Turkey, Foreign Minister Ahmet Davutoglu welcomed Mottaki’s announcement and said his government was ready to do its best to help reach a solution to the standoff over Iran’s uranium enrichment program. The New York Times today has published an Op-Ed piece by Alan Kuperman of University of Texas, in which the author calls for an immediate US air strike against Iranian nuclear facilities. The significance of the article is its publication by the New York Times. Negotiation to prevent nuclear proliferation is always preferable to military action. But in the face of failed diplomacy, eschewing force is tantamount to appeasement. We have reached the point where air strikes are the only plausible option with any prospect of preventing Iran’s acquisition of nuclear weapons. Postponing military action merely provides Iran a window to expand, disperse and harden its nuclear facilities against attack. The sooner the United States takes action, the better. Police clashed with mourners today at a memorial service in Isfahan for Grand Ayatollah Hossein Ali Montazeri. 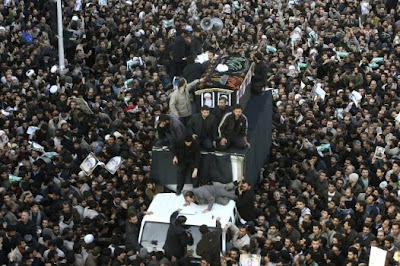 The mourners were observing the third day of Montazeri’s death, an important day of mourning, along with the seventh day, in Iranian tradition. Ayatollah Montazeri was one of the fiercest critics of the Iranian government. 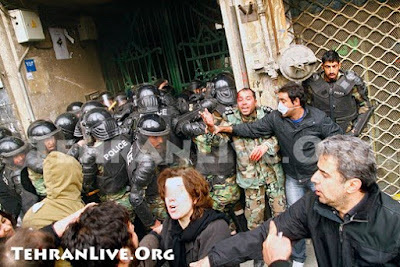 More than 50 people were arrested during today’s clashes. The seventh day of Montazeri’s death coincides with Ashura, one of Shia holiest days, the anniversary of martyrdom of Imam Hossein, the grandson of Prophet Mohammad. In modern times Ashura has carried a political overtone, a symbol of just struggle against tyranny. In 1978, Ashuar became an occasion for the largest anti-shah demonstrations in Iran, arguably the turning point for anti-shah movement in the country. This year's Ashura falls on Sunday 27 December. The coincidence of Ashura with the seventh day of Montazeri's death is expected to give rise to large-scale anti-government demonstrations throughout Iran. The White House Spokesman Robert Gibbs today warned Iran that December is “a very real deadline” ahead of new sanctions against the country over its uranium enrichment program. Earlier today, Iranian President Ahmadinejad had ridiculed the West for the deadline. “They say we have given Iran until the end of the Christian year. Who are they anyway? It is we who have given them an opportunity,” said Ahmadinejad said in a speech in Shiraz. I was travelling and unable to post on the blog. Hence this belated tribute in memory of the late Ayatollah Montazeri, who died in Qum on Sunday. I first met the Ayatollah in 1978 in Tehran. He had been freed from SAVAK’s prison earlier that year. I was introduced to Montazeri by Ayatollah Shahroudi, who was my cellmate at the notorious Komiteh prison. It was few days before the shah would leave Iran. Sharoudi and I were among the very last SAVAK prisoners at Komiteh. Although there was an air of excitement in the city, but Montazaeri, nor Shahroudi, expected that the religious hierarchy would soon take over the government. (Shahroudi was later assassinated along with 71 other high-ranking officials of a young revolutionary government in a powerful bomb explosion at the headquarters of the Islamic Republic Party in Tehran). The next time I met Montazeri, he was a powerful leader of the Islamic Republic and I was a young journalist covering the constitutional assembly that was drafting the country’s new constitution. The first draft was written by Habbibi and other close confidants of Ayatollah Khomeini from his Neauphle-le-Chateau days and it did resemble the Belgian constitution, with no mention of Velayat-e Faghih, the ultimate authority given to a cleric to rule over the country. Montazeri was pushing for it hard and I was there (at the old Senate building) to interview him, actually more to sit down and discuss the subject with him. He gladly agreed to give me the interview. This was not the few days prior to shah’s departure; we were on the opposite of political spectrum now. But he was as friendly and warm as ever. He obviously could not satisfy me why the draft constitution should be so radically changed. In his later years he came to regret the way his reading of Velayat-e Faghih had been altered to justify the creation of an autocracy in the country. On that day, however, he was a strong defender. Notwithstanding my questions and the intense discussion that pursued on that hot summer day, I left the room thinking that the man had a good heart and was as a gentleman and a scholar. This in spite of his reputation those days as a lightweight, the subject of many popular jokes thrown at him for his simple rural manners. There were probably this rural upbringing and his simplicity that endeared him to me on that day despite our deep differences. He would remain a simple man until his last day during a period that other ayatollahs lived princely lives. 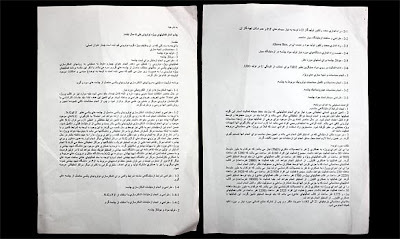 Our third meeting was when the prosecutor under the authority given to him by that same constitution closed our paper, Neda-ye Azadi (“Voice of Freedom”) which by then had become arguably the most popular daily in Tehran, mainly because the government had closed down Ayandegan and other popular press. I was the editor-in-chief and the prosecutor had also signed my arrest warrant. I was there to see Montazeri to get his help. As powerful as he was then, it was clear that the closure of Neda was part of a larger push to silence the opposition papers and Montazeri could not do anything about it, even if he wanted to. One of the first real signs of how politically fragmented a government the Islamic Republic would become. I had to go into hiding. A few days later the Students of Imam’s Line occupied the US Embassy, took Americans hostage, and overthrew the centrist government of Mehdi Bazargan, an old friend of Montazeri. The ayatollah later broke from the establishment on matters of principle, including his opposition to the mass killing of nearly 4,000 political prisoners during the last months of Khomeini, to whom Montazeri was the heir apparent at the time. He paid dearly for his courageous stand, was stripped of his powers and later was put under house arrest. He left the world not a broken man, however. But a powerful symbol of opposition to dictatorship. We will all miss him. He was a gentleman and a scholar. May his memory stay alive forever! Reports from Iraq indicate that the Iranian troops have left a border oil field inside Iraqi territory late on Friday. The Iraqi government had accused Iran of sending its troops across the border on Thursday, occupying and raising an Iranian flag over Fakkah oil field’s oil well No. 4. The field is situated just inside the Iraqi territory, at Maysan province, some 500m from an Iranian border post. Iraq’s national security council held an emergency meeting on Friday to discuss the incident. Iraqi government spokesman Ali Al Dabbagh said in a statement after the meeting that the seizure showed the need for clearly defined borders between Iraq and Iran. “Regarding your remark and your concern about me being a "joke" I should remind you that those who are briefing you, are the ones telling you jokes; that's why you have this illusion that the political turmoil and the critical situation of the society is like a joke! I remind you that what I do and will do is based on my belief and duty in defending the rights of each and every citizen, and this for me is the main goal and responsibility," said Karubi in response to Yazdi’s remarks [Tagheer, 16 December]. "In another part of your remarks you talked about the heaven and hell and asked some to leave the alliance of the devil! Are you the representative of God and the judge to determine good and bad deeds? How could you acknowledge this right for yourself to call anyone who does not agree with you an ally of the devil and anti-Islam? Twitter has announced its 2009 most popular topic: #iranelection. Other Iran-related topics were high on the most used keywords: Iran at 4th place and Tehran at 5th. "The engine and various fuels have been tested and the platform is now highly reliable. The latest tests to be carried out are mainly to do with the variety of warheads that it has to carry." "Some of the warheads obviously have been designed to be able to evade anti-ballistic missile defenses of the enemy in actual battle conditions." In a rare public speech, Israel’s military intelligence chief Maj. Gen. Amos Yadlin said today Iran was close to a "technological breakthrough" that would enable it to build nuclear weapons [AP, 15 December]. Gen. Yaldin said Iran had enough nuclear material for a warhead and was close to being able to build one. Yaldin’s comments are the latest examples of a possible run-up to a military conflict with Iran. Yesterday, the Times reported that Iran was experimenting with neutron initiators, a necessary step to build a nuclear weapon. 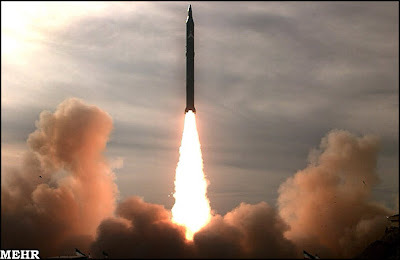 Iran has denied reports that its nuclear program is aimed at building the bomb. 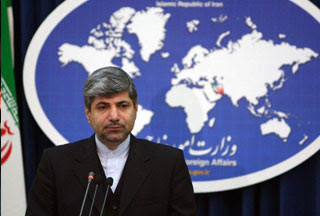 Iran’s Foreign Ministry Spokesman Ramin Mihanparast today told reporters in Tehran that Times of London report on Iran’s alleged experiments with neutron initiators was fabricated as part of a propaganda war waged against the country. The document describes an Iranian program to test a neutron initiator, the component of a nuclear bomb with no civilian use. If genuine, the document would indicate a final stage in Iran's attempt to build a nuclear bomb. The Iranian government has in the past strongly denied the existence of a bomb-building program. In yet another turn in Iran’s position toward uranium swap with the West, Foreign Minister Manuchehr Mottaki told said the country was ready to exchange the bulk of its stockpile of LEU as proposed by IAEA. Mottaki, speaking to reporters at a regional security conference in Bahrain on Saturday, added that Iran was ready to swap 400kg of the proposed 1,200kg during the first phase. Mottaki was not clear when the next phases would take place and if all 1,200kg LEU would be swapped. “We accepted the proposal in principle but there were differences in the mechanism …We suggested in the first phase we give you 400 kilograms of 3.5 percent enriched uranium and you give us the equivalent in 20 percent uranium,” Mottaki said. Mottaki also suggested that the swap be take place on Iran’s Kish Island in the Persian Gulf. The United States Secretary of State Hilary has warned Latin American nations against maintaining a good relationship with Iran. "we can only say that is a really bad idea for the countries involved." Clinton was also quoted as calling Iran "the major supporter, promoter and exporter of terrorism in the world." She failed however to elaborate on that statement. For 16 Azar, Iran's law enforcement appeared hard pressed during student protests around the country, centered at roughly a dozen universities and at least one high school. Students appeared to achieve periods of uncontested control of their campuses, enabling them to hold loud and defiant demonstrations. This can be seen in the handful of available videos and photos, particularly at Amir Kabir University. It can actually be said that, in some respects, the students may have managed to exert initiative over their security counter-forces. 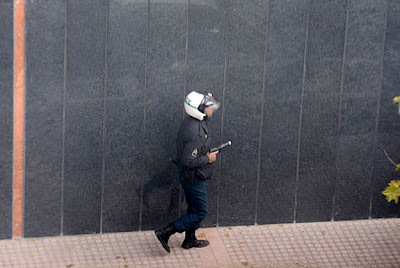 For their part, the available videos and photos show the IRIPF (Islamic Republic of Iran Police Force) and Basij mostly on the sidelines, unable to effectively counter or disperse an overwhelming presence of students lodged within their university campuses. All told, Iranian officials claim around 200 arrests were made in Tehran alone, with dozens elsewhere. These figures are low for the size and nature of these demonstrations. There are reports of isolated injuries, but open source video and photos have yet to emerge to show the same level of force used by the IRIPF in previous episodes of post election unrest. It may be the IRIPF was ordered to lessen the level of force used against the student demonstrators, or simply that dispersal efforts couldn't be used as effectively, given the circumstances of successfully assembled crowds and their positions within university campuses. Admittedly, there is not enough evidence or confirmed reports for which to draw any particular conclusion. 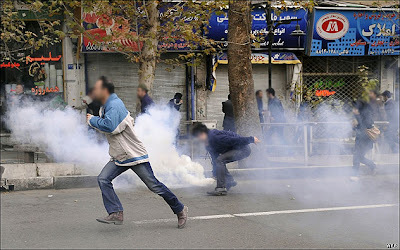 The Basij, on the other hand, seems to have acted in their customary manner. However the video and photo evidence depict periods where they were heavily outnumbered and reduced to harassment efforts or, at times, simply taking to the sidelines. Plainclothesman which could have been Basij were also seen filming the demonstrators as well as making what seemed to be targeted arrests. Nonetheless, there are numerous unconfirmed reports of Basidji using excessive and inappropriate force against the student demonstrators. It doesn't appear the IRIPF was as effective in clamping down unrest as it was in September and November. 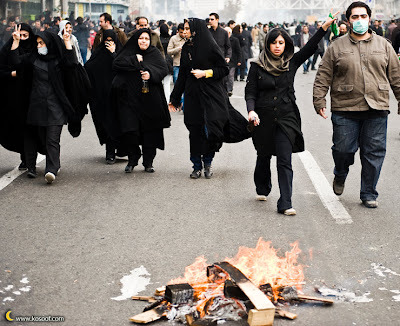 Both Iranian law enforcement and Green movement activists are sure to draw respective lessons from the results of 16 Azar, for future use in anti-establishment demonstrations in Tehran, as well as other potentially coordinated flashpoints across the country. An IRIPF motorized patrol. Both regular IRIPF and conscript-soldier elements are seen participating in what looks like a less than well directed action. 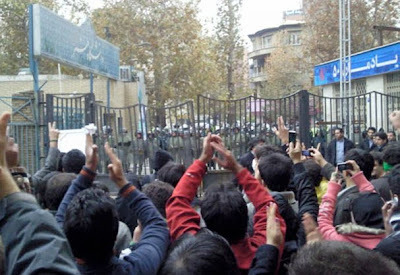 A handful of IRIPF officers look on in apparent helplessness at what appears to be the entire student body protesting within the campus of Iran University of Science Technology. Plainclothes security elements (probably Basidji) filming student demonstrators, while a handful of IRIPF officers and attached conscript-soldiers are seen standing aside outside the school gates. A student mob engaged in the destruction of school property at Amir Kabir University (AKU) in Tehran. Hard to see in the video, but a law enforcement presence doesn't appear evident. Confrontation at the broken gate at AKU. Ranking security officers include no less than an IRIPF Sartip Dovom (~General) and a Sarhang (Colonel), among a vastly outnumbered collection of IRIPF attached conscript-soldiers and a few Basidji plainclothesmen (or possibly campus security). 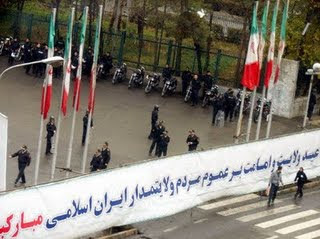 The officers clearly look exasperated amid the constant blair of students chanting "Death to Khamenei!" Crowd control during a volatile confrontation at the broken gate entrance at AKU. 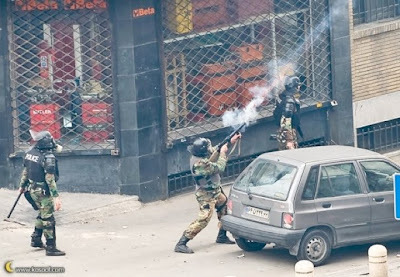 An IRIPF Colonel personally intervenes at the point of contact, with only one regular policemen seen in close proximity. Meanwhile, a squad of conscript-soldiers appear in line-formation further back. Mashad University. An IRIPF Sarvan (Captain) directs at a gallup a Sotvan Dovom (Lieutenant Second Class) soldier, in front of motorized police and IRIPF attached conscript-soldiers wearing their winter field jackets. Officers and dismounted motorized elements of the IRIPF assemble at Tehran University in the morning hours preceding 16 Azar activities. Note the use of a non-transparrent banner attached along the front gates of the university, blocking street level line-of-sight into the campus. Motorized anti-riot forces of the IRIPF. Appears to be decision time for dismounting and deployment. 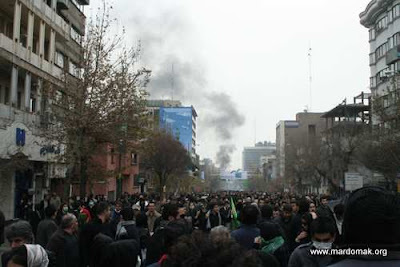 The view up ahead down Jamaizadeh Steet: a skirmish line is engulfed in tear gas. Note the density and resiliency of the demonstrators. A well equipped IRIPF Ostavar (Master Sergeant), carrying what appears to be a pistol paintball gun. Face off at Amir Kabir University in Tehran. On the other side of the damaged gate (caused by the students), stands roughly two squads of outnumbered conscript-soldier elements of the IRIPF. Center-right in front of the gate can be seen plainclothes elements of either campus security or possibly the Basij. 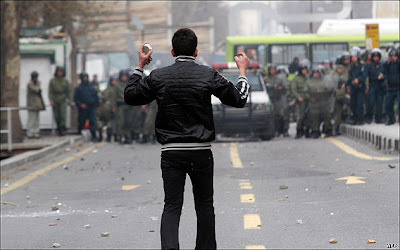 Members of the Basij hurl stones at demonstrating students, amid a cobbled together collection of IRIPF regulars and attached conscript-soldiers. An IRIPF Ghuban Dovom (~Sergeant) follows the Basidji example in a contest of stone throwing, as does a soldier-conscript attached to the IRIPF. Note the curious looking home-made club-sticks of the Basij. The bunched up use of IRIPF regulars, soldier-conscripts and Basij must make for a difficult force with which to exert effective control and cohesiveness. Adding to this, attaching the severely undertrained Basij to Iran's professional police force appears to make it near impossible to maintain proper discipline. A true sense of law enforcement leadership is not evident in this photograph. Later in the day, Tehran. 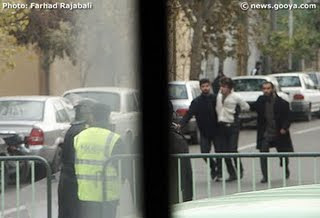 Targeted arrest of a student demonstrator by plainclothesmen; either undercover security elements from some branch of the IRI, or Basij. Note the use of crowd control barriers visible in the foreground. Iran’s Mehr News Agency confirmed today that Iranian authorities believe that IRGC Brig. Gen. Ali Reza Asgari, former deputy defense minister of Iran, is in the United States. Gen. Asgari disappeared in 2007. Uskowi on Iran reported at the time that Gen. Asgari had defected to the US. Asgari was believed to be living in Virginia. On Tuesday, The Iranian foreign ministry spokesman said 11 Iranians were being detained in the US. The spokesman named only the missing nuclear scientist, Shahram Amiri. Mehr’s report identified the other ten, including Gen. Asgari. Iran has accused Saudi authorities of arresting and handing over Shahram Amiri to the US authorities. Amiri is one of Iran’s top nuclear scientists who was reportedly working at newly disclosed Fardu uranium enrichment plant near Qum. He was on a hajj trip to Mecca when he disappeared. The Saudis today denied the charge. “Saudi authorities searched for him after being informed of his disappearance in Medina and at all the hospitals, hotels and centers in Mecca but they could not find him,” Saudi Foreign Ministry spokeman Osama al-Nogali told reporters in Riyadh. US State Department spokesman P.J. Crowley, speaking to reporters in Washington, declined to comment on the situation.